As a manufacturer, understanding the type of business you are selling to is extremely valuable. The fact that my family owns both funeral homes and a cemetery is one of our best competitive advantages. We know that most cemeteries aren’t “cash cows.” We know that customers are becoming more informed, cremation rates are on the rise and margins are getting slimmer. We know we need to keep growing too. Create scripting that upsells – I find the words “scripting” and “upsell” have negative connotations in our industry and I’m not sure why. If you believe that a “high-end” product has the most value, then you shouldn’t feel bad about upselling to drive your sales towards that product line. You also shouldn’t feel bad about creating scripts to help your customer understand the value that you see. Think about what you like about a certain product line. How are you transferring those positive feelings to your customers? Become confident in your product – I have spent a lot of time in our manufacturing plant. I can’t even begin to quantify the value that has been created when I am making a sales presentation. I know exactly why certain product lines are more expensive than others. 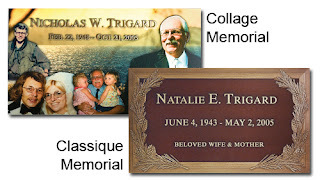 For example, the full color photo Collage memorial is more expensive than the Classique memorial because the Collage takes a lot of design time. It is fully customized, while the Classique is a templated design with names, dates, and emblems easily switched out. Come see us at Trigard Memorials and ask questions. We would love to help you increase your knowledge of our products. Set goals for yourself or your sales team – Set goals that drive the behaviors you want. We all know setting goals is a good thing. Narrowing your goals to specific product lines can be an even better thing. It really is amazing what an upsell can do to your bottom line and to your confidence. For instance, I believe that the Collage memorial is Trigard’s best product. Every time I walk through our cemetery, I believe it more and more. After all, the collage series is like a magnet that pulls you in. It tells a story about a person and will be valuable to their family for generations to come… and I tell my customers that. That’s how I create value in what we offer. How will you?